Commvault is about to offer its flagship data protection and e-discovery portfolio as a cloud-based managed service. The new Commvault Complete Backup & Recovery-as-a-Service (B&RaaS), unveiled during this week’s third annual Commvault Go conference in Nashville, will allow partners to deliver backup and recovery of virtual machines as a subscription-based offering hosted in different public clouds. It is initially available through Amazon Web Services (AWS) and Microosft Azure. The service will also include backup-as-a-service protection of cloud-native application data, initially from Office 365 and Salesforce. Set to roll out this quarter, the service will appeal to MSPs and CSPs seeking to offer more simplified turnkey data protection services without implementing any hardware. It is also aimed at customers who don’t want to deploy or manage gear, especially at remote sites. 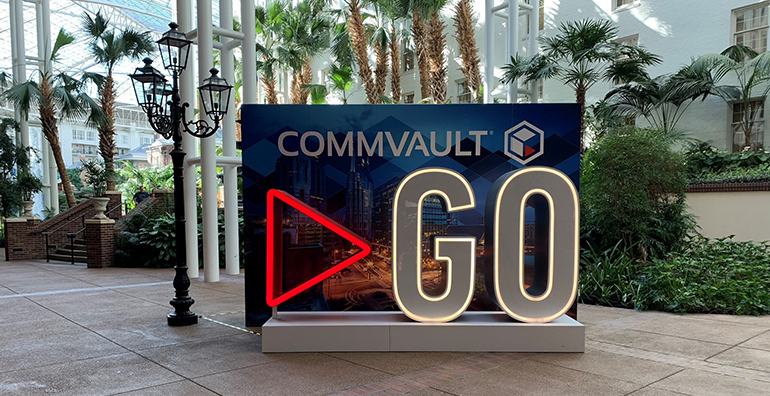 Commvault is launching the new service nearly three months after the company revamped its go-to-market strategy by consolidating its data protection and e-discovery portfolio, combined with a companywide shift toward selling and delivering through partners. The company is rolling out new cloud-based subscription services. Commvault is known for its high-end data protection software used by large enterprises. The SaaS-type services are the company’s latest effort to broaden its addressable market to smaller organizations than it has traditionally served. While the new services will allow MSPs and CSPs to deliver Commvault’s backup-as-a-service to small shops, company officials see it having wide appeal over time. Describing the new managed SaaS-type service as “a natural move,” Bunte explained that Commvault is putting together “market spaces,” which are platform layer connectors linking the backup-as-a-service suite with public cloud marketplaces. It builds on the company’s entre last year with its endpoint-as-a-service offering, which provides for laptop and desktop backup and restore, data loss prevention and ransomware protection, the AWS and Azure VM protection-as-a-service are Commvault-branded services hosted in the respective public clouds, said David Ngo, Commvault’s senior director for managed services and SaaS. Among the first to recently start testing the service is Marc Tritschler, a product manager at Spirit Communications, a fiber service provider in Columbia, South Carolina. “We see long-term storage services opportunities that can help our health care and government clients as well as for continuity, governance and HIPPA compliance,” Tritschler said. Onno van den Berg, a mission-critical services engineer at Schuberg Philis, a Netherlands-based service provider, is among those eyeing the service. “We see a lot of customers moving into single cloud or multiple clouds and this can fit in with certain use cases,” he said. Bunte said Commvault plans to more aggressively push the service in the next quarter. “We’re in the final stages of testing out, particularly some of the market space activities and getting our partnerships nice and aligned with AWS and [Microosft] Azure,” Bunte said. Along those lines, the company this week broadened its HyperScale appliance line at Commvault Go by adding a low-end system for small businesses and remote sites, and a larger scale-out system targeted at enterprises, MSPs and CSPs. The current midmarket HyperScale 1300 appliance supports up to 170 TB, while the new the Commvault Remote Office Appliance is for locations that require only 5-15 TB, which can max out at 30 TB with two systems linked together. At the high end, the new HyperScaleHS3300, which supports capacities ranging from 174 to 262 TB, will be available in December. The extension of HyperScale comes just one year after Commvault entered the appliance market with Commvault-branded systems based on hyperconverged systems from Fujitsu. Commvault, which also has alliances to deliver its Commvault Complete Backup & Recovery Software integrated with hyperconverged systems from Cisco and Hewlett Packard Enterprise, widened its partnership with HPE with support for the HPE StoreOnce line and with NetApp to deliver integrate the software with its primary storage gear. At Commvault Go, the company also released a revamped admin console, called Commvault Command Center, new orchestration capabilities and launched a new e-discovery tool called Activate.